With the semester coming to an end and the new year approaching, we are taking some time to reflect on the busy summer months. This blog takes us back to Welcome Weekend 2014 to kick off our three-part Summer Review series. 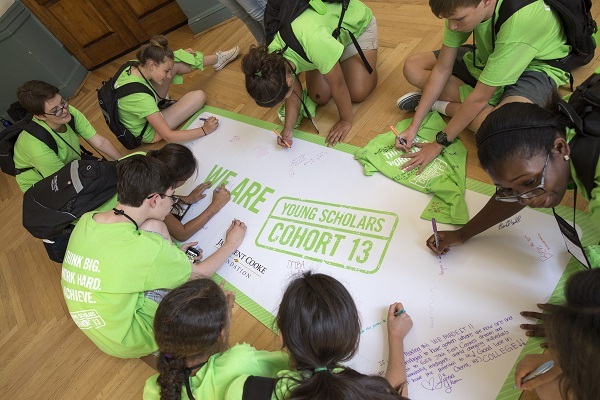 At the end of June, the Jack Kent Cooke Foundation invited all new Young Scholars in our 13th cohort, and their parents, to Johns Hopkins University in Baltimore, MD. The event, fittingly titled Welcome Weekend, brought the cohort together for the first time since becoming a Young Scholar in 2013, and introduced the students and parents to the open community of scholarship and support that serves as the pillars of the of the Young Scholars Program. Hosted by Jack Kent Cooke Foundation staff, including all 14 educational advisers and the program’s director, the event’s sessions were based on the theme of Putting the Puzzle Together, creatively exploring the academic journey these scholars have already embarked upon and will continue to as they enter high school this fall. While the four-day event allowed scholars and parents to get an inside look into the comprehensive Young Scholars Program, the weekend also sought to inspire our newest scholars. Dr. Kenneth Ginsburg, a leading pediatrician specializing in adolescent medicine, lecturing to both scholars and to parents in separate sessions on managing stress and building strength through internal resilience, captivated his audiences by providing fresh perspectives to students and to parents on how to approach the high school years. Nate Marshall, a poet, writer, rapper, educator, and activist from the South Side of Chicago, delivered his inspirational poetry at the dinner set at the Walter’s Art Gallery. Nate was a Young Scholar in cohort 3, and his performance clearly showed what a Young Scholar can accomplish when he or she is dedicated to fulfilling their dreams. Educational Adviser Matthew Ozea reprised his acclaimed role (and once again pressured the seams of his snug polyester suit) as host of The Scholar Scramble. Set in a game show format, this friendly competition pitted scholars against parents to test their knowledge of the Young Scholars Program. Though a close contest, the scholars prevailed and basked in their glory. Scholars worked in tandem to complete The Amazing Race, a team-building event in which scholars had to work together to solve puzzles while exploring Hopkins’ campus. A handful of scholars performed in the Scholar Talent Show, showing off their diverse talents, which included musical performances, dancing, poetry reading, and the solving of a Rubik’s Cube in less than two minutes… with one hand.